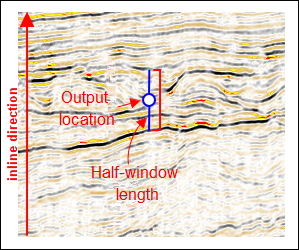 Description Calculate dip by analysing coherent features in seismic data. A dip field is a measurement of the angle of formations. This process generates a dip field by analysing shifts in correlation for a moving window through a seismic volume. Dip fields can be used to calculate curvature, dip azimuth and are used as input to perform calculations guided by the structure. Dip values are measured in Vertical Dimension (time or depth)/Horizontal Dimension (e.g. milliseconds/inline, milliseconds/crossline, meters/CMP). If the dip field is calculated from a volume in depth, then the units of apparent dip will be meters/IL. If the dip field is calculated from a volume in time, then the units of apparent dip will be milliseconds/IL. The apparent dip values are per single IL or CL, regardless of the increment of the dip field.Convert the dip to m/m or ms/m using the IL and CL spacings from the 3D survey. The algorithm is applied separately in the inline (IL) and crossline (CL) directions. Insight calculates dips by dividing the change in the vertical dimension between adjacent samples by the horizontal distance. A variable number of samples may be used in the calculation, determined by the half window size specified in the dip process window. The contribution of each sample to the final dip value is weighted according to the dip confidence. The remainder of the description is given for calculating dips in the IL direction and applies analogously for the CL direction. 'N' traces are selected along the output IL, centered on the output location. 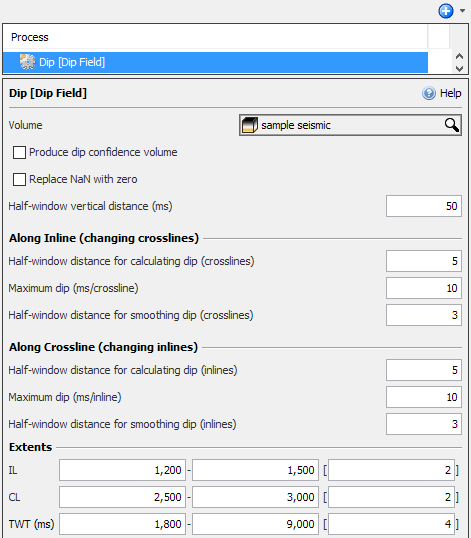 'N' includes the output location itself plus twice the value entered in Half-window distance for calculating dip (crosslines) in the dips settings. 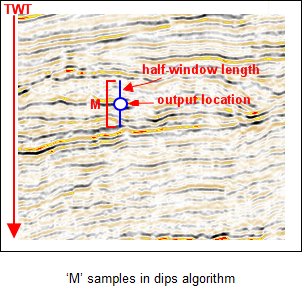 'M' samples are taken from each trace, resampling using sinc interpolation if required to place the middle sample on the line of the dip. 'M' includes the output sample plus twice the value entered in Half-window vertical distance (m) in the dips settings. At this step, an array of samples containing 'N' columns and 'M' rows is produced. Each column is scaled by a gaussian filter, then all the columns are summed to produce a single column of 'M' samples. Hence, traces further from the central output trace have a lower contribution to the sum. Each sample is squared, then scaled by a gaussian filter. The dip amplitude is the square root of the sum of these values. If the Half-window distance for smoothing dip (crosslines) parameter is non-zero, this amplitude is not used directly. Instead, the amplitude is computed for that number of locations, and the final dip amplitude is the simple mean of these values. The process repeats that computation for increasing positive and negative dip values until it finds the maximum amplitude, indicating the best dip. This value is a measure of the slope between adjacent sample values along an inline. It is measured in vertical units per crossline (e.g. milliseconds/crossline). This value is a measure of the slope between adjacent sample values along a crossline. It is measured in vertical units per inline (e.g. milliseconds/inline). This value is a measure of the slope between adjacent sample values along a CMP axis. It is measured in vertical units per CMP (e.g. milliseconds/CMP). This value is a measure of the coherence of the calculated dip value with neighbouring samples. It is measured as a probability between 0.0 and 1.0, with a higher value indicating a greater continuity between adjacent values. The value is calculated via a semblance based coherency algorithm. In the Details Panel for the dips process, select an input volume for the process at Volume. 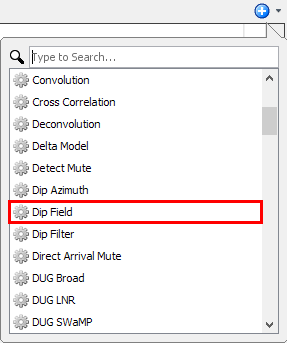 The fields to define more settings for dips will be available. Select the Produce dip confidence volume check box to generate a Dips Confidence volume. Insight will always calculate the dip confidence for internal use, even if you do not choose to create the volume. Select the Replace NaN with zero check box to replace the NaN values with zero dips/confidence. In the Extents section, you can define the IL, CL and TWT/TVDSS extents and their increments for the dips output. These parameters are available only for 3D dips output. By defining the extents of the output, you can speed up the export of the dips output volume whenever needed. Adjust other parameters as necessary (refer to the algorithm and terminologies above). As a result of this process, a new volume is available in the Volume tab. The most common way to display Dips is to use a display group that consists of the dips and the volume it represents (see Creating a Group). Note: Insight draws dips vectors only in the section views, and not in the 3D View. Channel 1 is the apparent dip in the CL direction (i.e. along a CL, changing ILs). Channel 2 is the apparent dip in the IL direction (i.e. along an IL, changing CLs). Channels 3 and 4 are the confidence (from 0.0 to 1.0) of the values in channels 1 and 2. Channel 5 is the combined confidence. These confidences do not yet affect the operation of any of the dip-using algorithms, but can be used when drawing dips on the screen. See the Dips volume in the Volume tab. If the dip field is calculated from a volume in time, then the units of apparent dip field will be milliseconds/IL. Therefore the vertical dimension of the input volume will be reflected in the dip units. 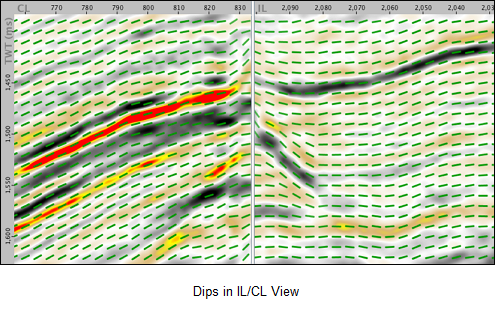 The apparent dip values are per single IL or CL, regardless of the increment of the dips volume. It is therefore trivial to convert the dip to m/m or ms/m using the IL and CL spacings from the 3D survey. Insight also provides a value to indicate the confidence in each dip. Strong, clean events provide high confidence dips, while noisy and heavily faulted data show low confidence. If you choose to create a "Dip Confidence" volume (step 2 in Define dips settings), this volume will have values between 0.0 (least confident) and 1.0 (most confident). In the Volume tab, the "Dips" volume has Adjust opacity dips to indicate confidence selected by default. High-confidence dips are more opaque, while low-confidence dips are more transparent. Tip: It is possible to view the dips along an arbline. In this scenario, the confidence is projected onto the plane by considering the IL/CL confidence values to represent an ellipse and taking the radius of the ellipse in the direction through which the plane intersects it. You can export the dips volume generated from the process to .dugio or SEG-Y formats (see Exporting a Volume to DUG I/O and Exporting a Volume to SEG-Y) but dip fields generated from gather volumes cannot be exported. Dip along CMP measured in vertical units (for example milliseconds/CMP). Dip confidence measured as a probability between 0.0 and 1.0. Dip along crossline measured in vertical units/inline (milliseconds/inline). Dip along inline measured in vertical units/crossline (milliseconds/crossline). Dip confidence along crossline measured as a probability between 0.0 and 1.0. Dip confidence along inline measured as a probability between 0.0 and 1.0. Combined confidence, which is the average of the other dip confidence values as a probability between 0.0 and 1.0.